The limestone cliffs at Bay Cay near Five Cays on Providenciales. The small beach at Bay Cay. Bay Cay is a small uninhabited limestone cay off the south coast of Providenciales. The island is one of the five islands that the Five Cays region was named after, with the other four being Middle Cay, William Dean Cay, Sim Cay, and Pusey Cay. Bay Cay is the largest of the five islands. Bay Cay has a total of a little over nine acres (a little under 4 hectares), with a terrain of limestone ironshore and low coastal vegetation. Ironshore is a local term for an intricate and weathered type of coastal limestone. A very small beach is found on the northwest side of the cay. The Turks and Caicos has two different islands termed Bay Cay. The larger and better-known Bay Cay off of North Caicos is part of the East Bay Islands National Park, and is a haven for wildlife, iguanas, and flora. The lee of Bay Cay is offers a sheltered anchoring site, and is a popular mooring location for visiting cruisers. During the winter and spring months, there’s often a small sailboat or two anchored in the area. Bay Cay is located quite close to South Dock, which is the primary shipping port in the Turks and Caicos. There’s typically quite a bit of activity going on, which is interesting to watch. A Turks and Caicos Islands Rock Iguana on Bay Cay. Bay Cay is a great stop on boat charter trips operating off the south coast of Providenciales. The south side boat trip attractions differ a bit from the popular secluded beaches on the cays east of Providenciales. 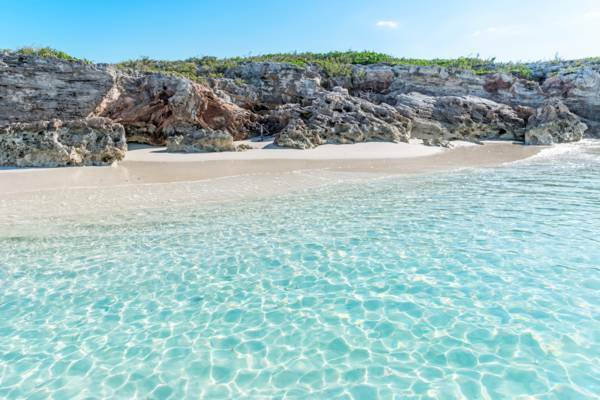 Instead of miles of white sand beach, there’s the incredible turquoise water of the Caicos Banks, the La Famille Express shipwreck, several small snorkelling shipwrecks, Bay Cay, Turtle Rock, and West Harbour Bluff. The south side offers a completely different excursion ambiance than what’s experienced at the exquisite Half Moon Bay, Water Cay, and Fort George Cay boat cruises. Bay Cay is fun to explore. There’s a small and sheltered beach, cliffs, iguanas, and an interesting ambiance. Small nurse sharks and stingrays can also be seen in the shallows off the north side of the cay. Another great sight in the area is Bermudian Harbour Bay. This long beach is separated from the mainland of Providenciales by a complex network of wetlands and red mangrove, and is consequently rarely visited. The shallows of this beach is a great place to see starfish (both the large cushion sea star, and the smaller red thorny starfish), and there’s interesting flotsam beachcombing as well. The wreck of a large fishing vessel is also grounded on the eastern side of the beach. 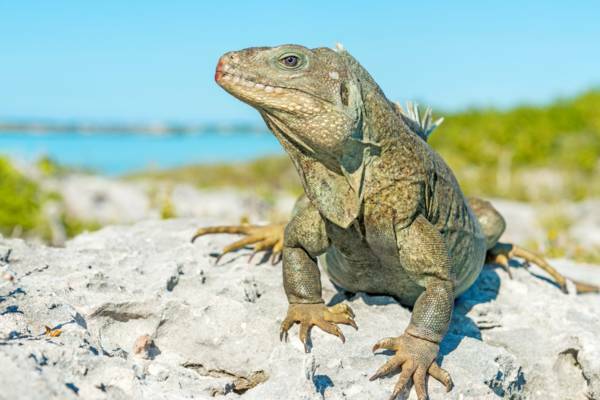 The docile Turks and Caicos Islands Rock Iguana is the best-known of our endemic land animals. This large lizard can be found on many of our uninhabited cays. Bay Cay supports a large population of iguanas, and is a great place to watch and photograph the endangered species, as the iguanas on the cay are very approachable. Last reviewed by an editor on 30 November 2018.